Albany When Australian experts wanted to know which terrorist groups pay pirates to capture ships, steal cargo and ransom the crews to provide new revenue for terrorists, they teamed up with two University of Albany professors to find the answers. 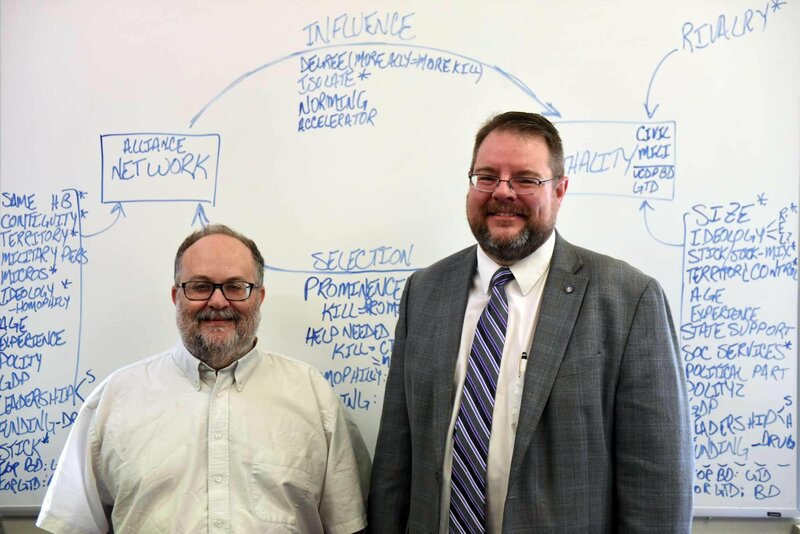 Karl Rethemeyer, interim dean of Rockefeller College of Public Affairs & Policy, and political science associate professor Victor Asal are creators of a database named BAAD — Big, Allied and Dangerous. BAAD is packed with in-depth information on hundreds of terrorist groups, their alliances and whether those ties are based on religion, ideology, affection or cold cash. BAAD can also monitor which groups abandon politics to become nothing more than criminal gangs. It can track which terrorists abandon violence to become elected officials. It also assesses which terrorists are likeliest to develop weapons of mass destruction—and hit the button. Rethemeyer and Asal offer BAAD as a tool for journalists and researchers striving to separate political spin and fake news from reality and facts. BAAD’s data is harvested from declassified documents, news articles, academic papers and even selected social media threads. Rethemeyer and Asal met in 2003 as the United States prepared to invade Iraq based on what later proved to be erroneous intelligence reports. “We were both looking for a project that would help us get tenure so we went to Sovrana’s to brainstorm over pizza,” Rethemeyer said. By the time they got to Death in a Cup, the Albany pizzeria and deli’s signature chocolate-drizzled custard dessert, they had envisioned a unique project. Rethemeyer has long been fascinated by how networks function. He earned his master’s from the London School of Economics before getting his Ph.D. from Harvard. Asal has master’s degrees from both Tufts University and the Hebrew University of Jerusalem. “We decided to focus on non-state actors who kill civilians intentionally for the purpose of changing a political regime,” Asal explained. “The database also includes insurgents who did not kill civilians but have caused at least 25 battle deaths of soldiers or policemen.” The pair immediately drafted teams of students to review all English-language reporting they can find on a region or terrorist group. Linguistic software complements their work by translating documents from Arabic, Mandarin, Russian and other key languages. But “robot linguists” have limits; they don’t grasp sarcasm and often stumble over idioms. While BAAD calculates a set of 30 to 40 terrorist groups want to strike on the U.S., its data also has contradicted several common beliefs held among U.S. officials about terrorism. Former president George W. Bush’s “global war on terrorism”, for example, seemed a misnomer since most terrorist groups have no interest in attacking America. And FARC guerrillas devastated Colombia for decades but had no plans to attack America or its embassy. Then in 2007, the Federal Bureau of Investigation described “environmental terrorism” America’s “number one threat.” Environmental Liberation Front members occupied four of 11 spots on the FBI’s Most Wanted domestic terrorists list. BAAD disagreed. “To this day, American environmentalist and animal rights groups have never killed anyone, not one human,” Rethemeyer said. Academics, U.S. and foreign government agencies are interested in BAAD’s intelligence. Rethemeyer recently spoke to South Korea’s National Assembly and Korean intelligence agencies about how North Korea might use terrorists. (“It’s a mistake for anyone to dismiss Kim Jong Un as a buffoon or a fool; he is sane and insecure and knows he can trust no one in his government,” Rethemeyer said.) The professors have applied for grants to expand BAAD’s scope to include American groups who threaten violence against perceived enemies ranging from gun background check advocates to government workers alleged to be part of the “Deep State,” a term conspiracy theorists apply to a stealth insurgency they believe plots against the president. The men are interested in how even inaccurate rhetoric about terrorism by elected officials and journalists can be used to justify political goals or government spending. And they believe it is crucial for Americans to know that terrorism is not the prosaic danger here that it is in the Middle East or even in Europe. Statistics indicate Americans should feel more secure. “I tell Americans that statistics show they have a bigger danger of being killed by their toddlers than of being murdered by a terrorist,” Rethemeyer said.